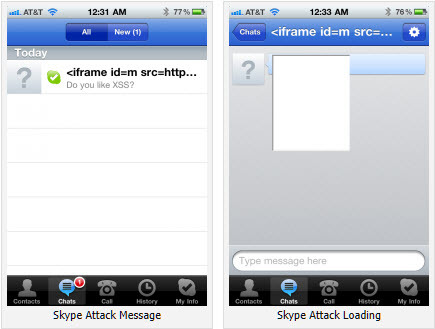 A bug in the latest version of Skype for iPhone and iPod touch makes its users vulnerable to having their address book stolen just by viewing a specially crafted message, says AppSec Consulting security researcher Phil Purviance. Skype is aware of the issue and is working on a fix. “We are working hard to fix this reported issue in our next planned release, which we hope to roll out imminently,” Skype said in a statement. Simple solution: Don't open text messages in the chat window, and check for a really quick update.